I think I mentioned in an earlier post that I've had a JustRite stamper sitting in my studio for months and months without even taking it out of the package! I finally used it to make a card with it a few weeks ago and decided it was high time for another one! It appears that I also need some more practice using this stamper as I could not, for the life of me, get the "N" to fully stamp...arrgghh. I'm sharing this card, with it's imperfect "N", in hopes that I'll soon be able to share why I kept having a problem with my stamping technique, how to fix it, and a new card with all perfect letters! I seem to remember seeing a post about this problem awhile back...now I just need to remember whose blog I saw that post on! 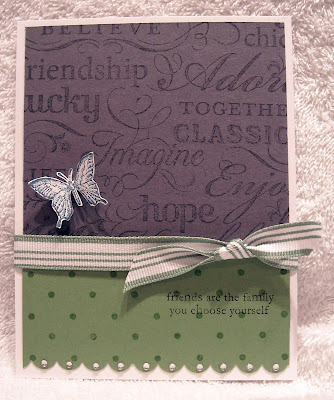 :-) This card is sporting some of my new Basic Grey paper...isn't it just divine...and stamps from Stampin' Up! This stamp set is called Dream a Little...it's a hostess set that is only available to someone who hosts a party. (Sorry!) The card layout is loosely based on a Verve Stamps sketch, which you can see here. And as you'll see over the next few weeks, I have some kind of obsession with grey and orange! I am really digging this color combo lately...delightful! Enjoy and have a happy Tuesday! 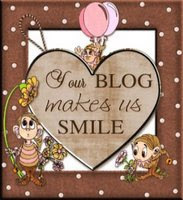 I've been blessed to recently make another blog friend, Sonia Kertzus, and she was kind enough to send me this sweet award! Sonia and her sister ran a digital stamp company, Worldwide Printable Stamps, and I had submitted work for the design team. Unfortunately, they had to temporarily suspend work on their business. You can see some of their images on cards I created here and here. Sonia always stops by with lovely notes and comments and I appreciate each and every one! Thank you Sonia!! And now I'm going to pick five folks to send this award on to...I visit a bizillion blogs over the course of a week but I have probably 10-15 I visit each day. Here are my top five that I never miss! 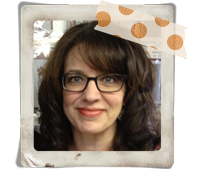 Julie Masse - OK, so Julie is my friend...of course I check out her blog every day! :-) However, she is also a wonderful designer, has delightful posts just about every day, and has great stuff to share. And sometimes she even posts pictures of her darling group of munchkins, which makes her blog even sweeter! Debbie Olson - Who doesn't love Debbie's work! 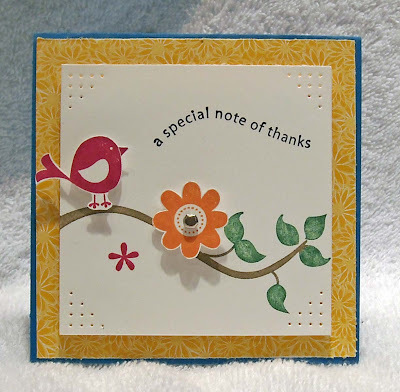 Debbie's beautiful stamping work has graced many a magazine page and numerous design teams. Her amazing work is always inspiring! Confessions of a Pioneer Woman - Is there anyone out there who doesn't know about this blog? If you haven't visited Ree's blog yet, you must! She shares about her every day adventures of living on a cattle ranch in the middle of Oklahoma with her four children and dashing cowboy husband. She is a hysterical writer, amazing cook, and has just recently starting inviting random blog guests to their remodeled ranch for all kinds of cooking and cattle expeditions...hello...does anyone want to go to Oklahoma? Pick me, pick me!! Ali Edwards - Ali is well known name in the scrapbook industry and although I'm not much of a scrapbooker, I admire Ali's unique style. 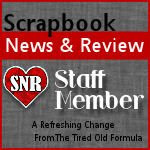 She seems to scrapbook with amazing ease and I love how much thought she puts into capturing the joys of every day details. I'm afraid that as busy Moms we probably miss too much and Ali makes a point of reminding us to take time to document those important (and ordinary) moments. Jodi Collins - I met Jodi at the Stamp NE event last month and until that time had never seen her blog. After the event I made a point of hopping on over to check it out and I've fallen in love with Jodi's work. Each of her cards are beautifully created and she has a flair for paper piercing! (A trait she likes to playfully point out...) And she's from NY...do I need to say anymore? ;-) Although these are a few of the blogs I visit on a regular basis, I try to visit each of the blogs listed on the left side of my blog often. Please take a moment to follow some of the links...each of them leads to sites filled with beautiful work! Thanks for stopping by! Yesterday I had a wonderful opportunity to stamp just for fun! And I managed to create six cards in just a few hours...It was delightful! Soon I'll have to pack up all of my supplies for our move. My goodies will be moving into a lovely but smaller studio. Our plan is to build in storage and counter space. However, that will probably leave much of my supplies packed so...I'm hard at work creating cards and projects to share during the transition. Last night I inked up some stamps I've never used and am looking forward to showing you the results! 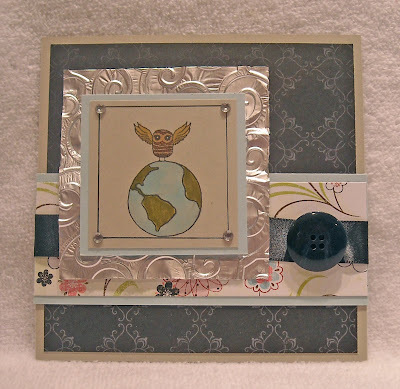 The card above is also using a brand new stamp, part of a new Stampin' Up! set called, Fifth Avenue Floral. It is a delightful set that I've had my eye on for awhile...I'm thrilled that it's now part of my collection! The paper used on the card coordinates with the stamps in the set and it can be found here. I used Copics to color in the flower, which has been cut out and attached with dimensional tape. The center of the flower is covered in tiny rhinestones, purchased from Taylor's store, Taylored Expressions. They're much sparklier (is that a word??) in person! :-) The layout comes from Taylor and was her weekly cupcake challenge. I thought this was a wonderful layout, simple, clean lines and super versatile! Go to Taylor's blog to check out her amazing work and follow links to other stampers who have participated in the challenge. Enjoy! The winner of the Odd Bird Planet Earth Day Extravaganza - Aluminum Foil challenge - is Heather from A Day in the Life of the Raborns! 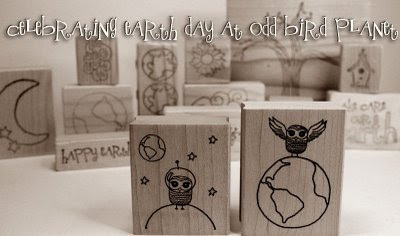 Congrats Heather, please email me at ksdm@comcast.net with your shipping address, including phone number, and we'll be sending you a special OBP Earth Day stamp! You'll also be entered into the Grand Prize drawing from $100 or $50 in FREE OBP stamps or a 25% off coupon!! Enjoy and thank you all for playing! One way to make quick and easy cards? Use your scraps!! The three thin slices of cardstock on today's card were all in the "discard" pile next to my crafting area. Two of the pieces I used on one card and the third on a second but the colors all worked well together. 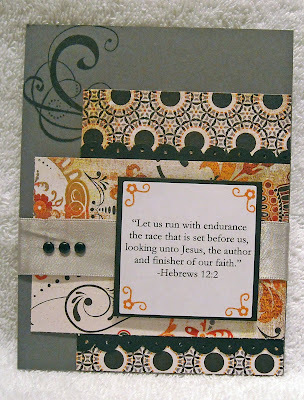 I simply stamped a background image, created a focal point with a main image, and added an embellishment! (I didn't even cut the scraps!) Total time to make this card - about 15 minutes! Now that is one way to keep it simple! :-) All of stamps used on this evening's card, with the exception of the "Friend" sentiment, which is from Papertreyink, are from Stampin' Up! The buttons are from a giant bag 'o buttons, where all lost and lonely buttons go! I layered two buttons to get the white/red effect. Gives the card a nice pop of color! Oh, the background leaf image is also from PTI and has been stamped with VersaMark ink and then embossed with clear embossing powder. Enjoy! This week it was Gina's turn to set the SALT challenge and her word was sheep or most specifically the Sheep of His flock. You can read Gina's write up on the SALT blog. Throughout Scripture, there are numerous references to Jesus being the Good Shepherd and those who trust in Him as the sheep. I love the picture that conjures up....In Biblical times (and probably even today), shepherding was serious work. A shepherd had to watch over the flock to ensure that none of them were lost or dragged away by predators. It's almost like a parent would watch over a child. In this way, we see that Christ watches over those that follow Him, loving them, caring for them, and protecting them. 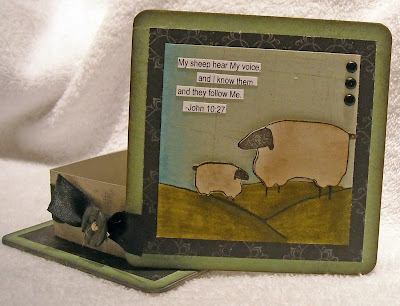 I choose John 10:27 as my verse this week and it reads, "My sheep hear My voice and I know them and they follow Me." In Matthew Henry's commentary he writes that Christians "hear Christ's voice; they discern it. They delight in it, are in their element when they are sitting at His feet to hear His word." In the second section about Christ knowing His sheep, Henry points out, "He (being Christ) distinguishes them from others. He knows their wants and desires, knows their souls in adversity, where to find them, and what to do for them." It's more than a casual knowing like we might "know" someone at work. The Good Shepard knows His sheep inside and out. The last part of the verse, follow Me, rings of the gentle command that Christ gave all of His disciples. Henry again states, "they (Christians) follow him; they submit to His guidance by a willing obedience to all His commands. The word of command has always been "follow Me." We must eye Him as our leader and captain, and tread in His steps, and walk as He walked." In an anxious world where it's hard to find trustworthy leaders or sometimes even friends, co-workers, family members, etc., it's good to know that Christ will never leave, will never forsake those He loves. Even if everyone you held dear were to turn against you, Christ would not. There is great comfort in that fact!! 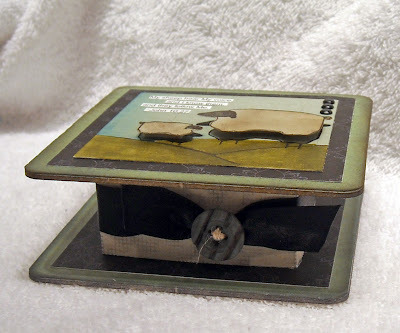 This week my project is a small trinket box, created using chipboard squares and a cardstock center. The stamps, which I just adore (aren't they fantastic) are from Cornish Heritage Farms. 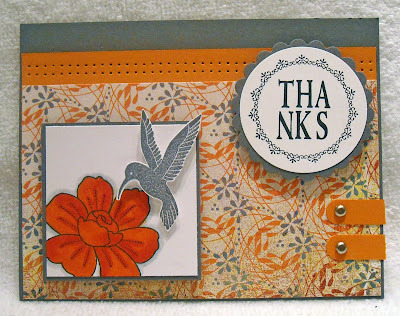 The sky and ground were colored with Copics and I really love the aged look they give when combined with Stampin' Up! 's Sahara Sand cardstock. A perfect combination with my antique sheep! Enjoy and may you find comfort in the great Shepherd today! After our successful Stamp NE event last month, Julie Masse and I decided that we'd like to host a few more stamping weekends! And while we're still working on exact dates and hotel locations, we are pleased to announce four more Stamping Around locations!!! -Late June/early July - Connecticut (New Haven/Danbury area) -August - Mid-West (St. Louis) -September-Vermont (Manchester) -Early November - Philadelphia Specific hotels have not been finalized but this is where we need your help! Each event will follow a similar format/schedule to Portsmouth, although we are considering including a full day of exhibits on Friday. We anticipate that the cost would be in the $200-250 price range for double-occupancy. For an example of hotels we're considering, we would like to secure the Equinox Resort in Manchester, VT for our September event. If you are unfamiliar with the area or the Resort, please take a look at their website. This is a superb location and there are many wonderful amenities offered at the resort - what a fabulous girls getaway weekend or a nice time to spend away with your spouse!! After selling out our Portsmouth event in four days we know the interest is high and many of you told us you would definitely attend future events! With each of these events, we must guarantee a minimum number of rooms and would like to open each city to 50-100 attendees. Therefore, we are looking for a response to gauge interest in each city. Please leave a comment here or email us (stampnewengland@gmail.com) and indicate if you are interested in more information only or if you would definitely like to attend. We're be more than happy to hold a spot for you!! More information regarding classes, teachers and specific cost and dates will be coming soon so please do check back often! And, if you're a stamp manufacturer or online store that has an interest in exhibiting or sponsoring the event, contact us asap, as available slots will be limited!! We're hoping for a warmer day here in New England...it was so cold yesterday for mid-April and the natives are restless! We need some warm weather so these boys can get outside and get rid of some of that energy! :-) Enjoy your day! Tonight's Keep it Simple Sunday was turning into "oh my goodness, how long can it possibly take to create an easy, attractive card Monday!" LOL! Ever have one of those days? My Keep it Simple project started last night and by 11pm I still hadn't finished what I started! My husband had a good laugh when I came around the corner of the living room without a card in hand! So much for simple...However, I will have a fun project to show later this week. ;-) Tonight, I tried channeling Nichole Heady (she does the most amazing designs that are clean and simple...I've never seen one of her cards I didn't like!). I chose to start with a straight forward layout. 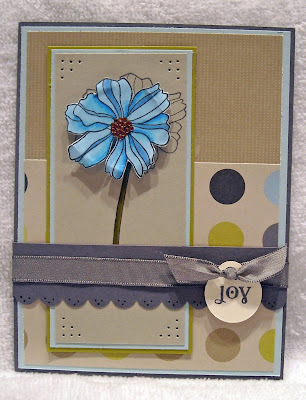 This is a wonderful way to create a card or background for a card...Take two pieces of cardstock and stamp a background design on both pieces of paper and then layer them on a base. 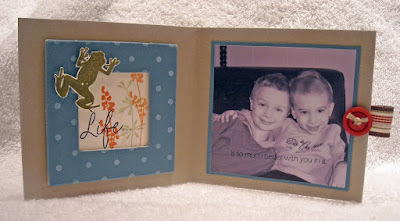 For this card I used a polka dot and word background stamps from Stampin' Up! The polka dot piece has been given a scalloped edge and (here's a true confession...I can not leave those little scallops alone!) added tiny rhinestones from Taylored Expressions. A piece of SU! ribbon was tied around the card, a sentiment added (really think I needed a larger, bolder sentiment on this card...next time! ), and popped up a dark blue butterfly on the front as an accent. 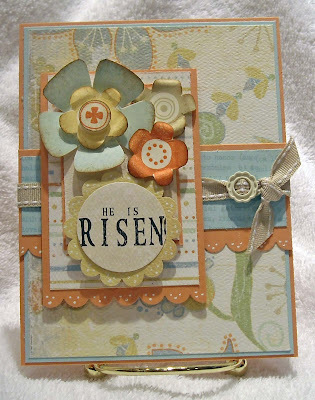 This basic design can be used again and again, you can change sentiments and background stamps, flip it on the horizontal, or attach a tag to the ribbon. 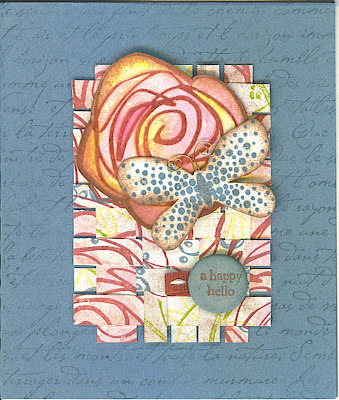 I think I might even have a fun design to share later this week, using the scraps from this card....hummm....Stay tuned! Enjoy! I took a trip to my local scrapbook store today, Wholly Scrap (how's that for a name? LOL! ), and was enticed by some beautiful Basic Grey paper....so...I bought it! Then I quickly drove home, put the kids down for their naps, and ran down to my studio to cut up my new paper to make a card! Since I was in somewhat of a hurry, I decided to check out the latest Splitcoast Sketch Challenge. It's actually last week's challenge but it's a clean and simple design so I hoped I could finish my card before any little ones stirred. I tipped the card on it's side, creating a vertical box (vs. horizontal, which was in the online sketch) for my layout. The stamp set used is from Stampin' Up! (and one of these days I'll actually remember to write down the name of the sets!) and that oh so lovely paper in the background is Basic Grey...isn't it yummy? I popped up a few of the flowers, the "dreams" banner, and the butterfly. (You can click on the image for a larger view.) And because I can't live with too much white space and Jodi does such a great job with piercing to "fill" in the space (her designs rock BTW)...I did just that! You know what, a little piercing sure does do the trick! Yeah, I'm running a bit behind on posting my Keep it Simple project...The good news is that my card was actually finished by Sunday but my ability to get a photo taken, downloaded on the PC, and posted on my blog eluded me! 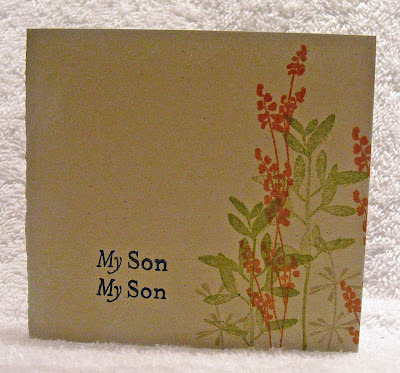 My card is a cute 4" x 4" size, which is perfect for mass producing. After Stamp NE we agreed that we needed to send cards to all of our sponsors, thanking them for their amazing generosity. Since we need to send cards to a whole lotta folks I knew I needed to come up with a simple design, something that would be quick to remake. 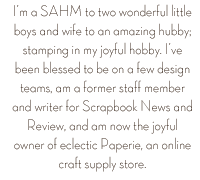 I am grateful for my wonderful Stampin' Up! catalog that contains so many simple layouts and this card layout was roughly based on a layout in the catalog. This sweet birdie set is a new one from SU! and this is one of the first times I've inked up the stamps. I just love the bird stamps!! (SU! has matching chipboard too!!) The papers are from SU! as well. I struggled with leaving the card so plain (boy, do I have a hard time with white space! LOL!) but decided it looked best without ribbons or brads. I did, however, add some piercing in each corner. 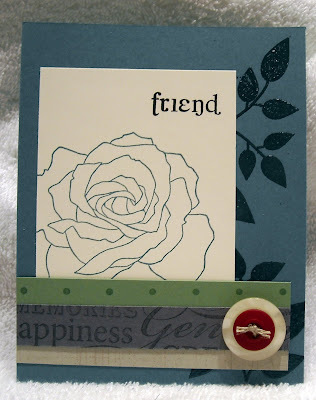 As one of our Stamp NE attendees said, "when my card needs something, I just add piercing!" That was the perfect solution for this card! :-) Well...we got a late start this morning so I need to finish up my coffee and get on with the day! Thanks for visiting!! My stamp room has been painfully neglected lately. It's so bad that I'm posting a card from years ago that I can't remember if I shared or not! If it's been over a year since something was posted on a blog, can it count as new? LOL! I'm hoping you'll forgive me if you've seen this one already...I plan to be back with new and exciting cards very soon! This card was created way back when I purchased one of the first Papertreyink sets. 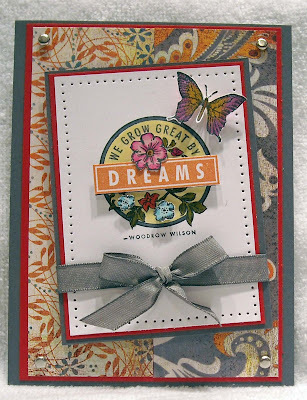 (The butterfly is PTI and the background, sentiment, and flowers are from Stampin' Up!) The woven background was created by first stamping random floral images on a piece of white cardstock. I then cut the cardstock into thin strips and wove the paper together. Once I had the size I wanted I snipped all of the ends to make them into an even rectangle. (I happened upon this weaving idea after having a bunch of thin strips of paper left over after making a card. I was sitting at my craft table fooling around with them and noticed that they were very easy to weave together. The weight of the cardstock holds the strips together quite well.) The flower, sentiment, and butterfly were added to top. I wish I had a better photo of this card (I scanned this image) because the flower is embossed and each image is mounted with dimensional tape so it's not quite as "flat" in real life! :-) Well it's Friday night and I'm off to spend some down time with my hubby!! Enjoy and have a lovely weekend! The Resurrection is good news to the believer and unbeliever alike! The believer can joyfully look forward to eternal life with Christ and the unbeliever can have assurance that Jesus is who He claimed to be. There is hope, there is life, there is relief from burdens, judgement, and eternal death...but it is only found at the foot of the cross. May God be pleased to grant each of you a renewed (or new) love for Christ this Easter! Just a few closing remarks on my card...(After writing so much of Christ's work, it seems trivial to talk about a card, doesn't it!) The lovely paper is from Crate and the flowers are from Stampin' Up!, as is the ribbon and ribbon slide. The sentiment? Hey, it's from my Just Rite stamper! I've had it for ages and just inked it up. I'm sure you'll notice that awful smudge on the right hand side. I squeezed the "risen" onto the image area, which caused a bit of a problem for inking the stamp. But I was determined (translation stubborn) about using two different font sizes on the sentiment so...I tried and tried but keep getting the smudge. I decided it kind of looked like an exclamation point! I considered Photoshopping it out but figured you guys would forgive a girl a smudge...won't you? Even though it's totally making me twitch right now... :-) Head over to the SALT blog to check out all the beautiful creations!! Are you loving our new design team or what?? Fantastic stuff! And make sure you check back every week as we're starting to post more frequently!! Enjoy!